An interesting attraction worth penciling into your sight-seeing tours around Kuala Lumpur is the National Planetarium. 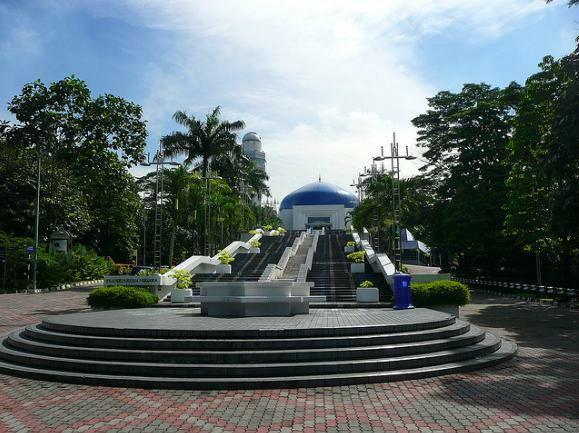 Located within the famed Lake Gardens Kuala Lumpur complex, between the Kuala Lumpur Bird Park and the National Museum, the National Planetarium which was opened to the public in 1993, is designed to resemble a blue-domed mosque. The exhibits located within the National Planetarium are divided into two main themes, namely Astronomy and Space Exploration. The exhibits consist of images, posters, mock ups, replicas and more, all of which aim to provide visitors with a better understanding of the science of space. The ancient observatory park offers replicas of various ancient Chinese and Indian observatories like a scaled down version of the famous Jantar Mantar. Also located here is a replica of the prehistoric monuments situated in Wiltshire England, the Stonehenge though it is fashioned out of fiber glass. This extremely interesting exhibit showcases the interior of the International Space Station including the sleeping and toilet arrangements for astronauts. Also on display here is the space suit of the first Malaysian man in space, Sheikh Muszaphar Shuko, who was launched to the International Space Station aboard the Russian Soyuz TMA-11 with the Expedition 16 crew, on October 10, 2007. Incidentally, Sheikh Muszaphar Shuko, is an orthopedic surgeon who earned his Bachelor of Medicine and Surgery degree from Kasturba Medical College, in Manipal, India. Also on display with the space suit are dehydrated packs of the famed Malaysian dish Nasi Lemak, which Sheikh Muszaphar Shuko carried into space. Yet another interesting exhibit located within the planetarium is a replica of the Arianne IV launch system which was used to launch MEASAT 1, Malaysia’s first satellite. The main observatory of the National Planetarium is equipped with a 14-inch (360 mm) telescope whose use if often demonstrated to visitors on tours of the planetarium. The star attraction at the National Planetarium is its Omnimax Theater(Space Theater) where films and shows are projected on the interior of the planetarium’s dome. Comfortable reclining seats enhance the pleasure of watching a film or show at the theater. . Several films are shown daily though fees are levied for the type of film shown. Details of charges are available on the website of the National Planetarium. If you have an interest in astronomy or space science then the National Planetarium in Kuala Lumpur should feature as a must-do on your sight-seeing list.